Welcome to the Fall 2016 One Room Challenge! For those of you new to the concept, Linda from Calling It Home created a blog challenge in which participants make over a room in a short 6 week period. It's chaotic, stressful, and exhilarating all at the same time. Many have compared it to childbirth, and while I can tell you that it pales in comparison to an unplanned natural delivery, it definitely brings a mental anguish and exhaustion that you forget all about when you reach the finish line, beaming with pride over your creation. A short time later, all you remember are the good times, the successes, and the beauty of your space, so you decide that it would be a great idea to do it all over again. And that's how you become involved in the cycle of the One Room Challenge. Ha! This will be our third round of participating as a guest blogger in the ORC. Every Wednesday, 20 featured designers post their updates, and every Thursday, hundreds of guest bloggers join in on the fun. You can find our Fall 2015 makeover of our laundry room and back entry here, and our Spring 2016 ORC of our dining room here. Fun fact: we recently revamped the spaces from our Fall 2015 ORC; the office space is now a shiplap mudroom, and the mudcloset is storage for cleaning supplies, household goods, etc. You can find those updates on my Instagram feed, hcbinteriors. Life has been more than a little hectic lately; if you check the date of my last post, you'll see that it was the final post of the Spring ORC. We didn't even decide to commit to this round until today. But the lure of whipping yet another space in our home into shape was strong, so here we go again. We will be focusing on our guest bedroom. It's located in the basement, and has no windows, no overhead lighting, and the outlets the lamps are plugged into are not connected to the lightswitch, so the room is a dark cave. Not very welcoming! It's also tends to be our clutter collector, the space where all items go to live until I have the time and space to put them away. This room, and my husband's cluttered office, are my secret rooms of shame. Because they are in the basement, I don't have to look at them until someone is coming to visit. And since those visitors are usually my very understanding in-laws, the rooms are usually just barely cleaner than the pictures shown below. Extra furniture that has no home. Clothes my kids have outgrown piled on the bed. Ok, now that everyone in American can feel better about their own mess, come back next week to see my design plan. 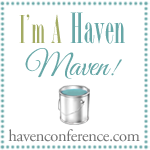 I'm thinking Southern Coastal, hoping that I can turn this into a welcoming, organized retreat. 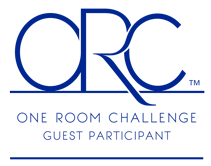 Thanks for visiting, and make sure to check out everyone else participating in the One Room Challenge! I feel you! My Master bath pics are pretty bad!! I have no where to go but up!! Let's do it! Looking forward to supporting each other through another ORC! I'm still slowly working my way through all the participants; can't wait to catch up on your room! Wow, that's quite the "before"! I can't wait to see what you do with this space. I have a drop ceiling room in my basement that needs attention too. Are you planning to do anything to the ceiling? I need ideas! Thanks, Amanda! Unfortunately, the ceiling is not in the budget. But, I have found some pretty options for replacement tiles when researching - if you search Pinterest for drop ceiling tiles or vinyl grid tiles, there are lots of options. Good luck!